Postdocs Jessica Linville (ES) and Sarah Soltau (ES) recently took part in Argonne’s annual Science Careers in Search of Women (SCSW) Conference. 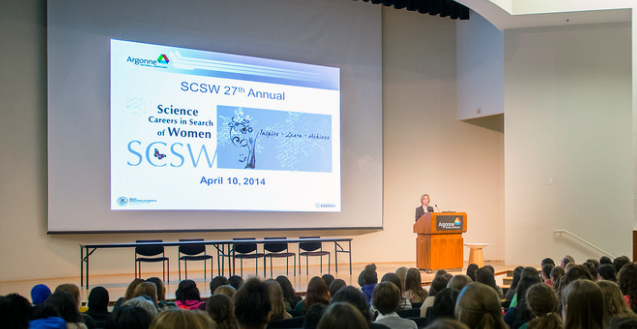 SCSW is a day-long program that provides aspiring young women researchers the opportunity to explore careers in science. The young researchers are in the nine and tenth grades and are just beginning to take biology, chemistry, physics, engineering and environmental studies classes. Jessica found presenting scientific research to high school students was much different than presenting to her peers at a scientific conference. The focus of her presentation dealt with the overall outcomes of a research project than the details of the actual research. “I told the students about the amount of space that bio-solids take up in the landfills instead of the mechanisms that increase methane from the bio-solids,” said Jessica. She discussed how her research will help reduce the amount of waste going into landfills and how much greenhouse gas emissions will be reduced. She made sure to cover the high-level points in language the students could understand. “Presenting to the students was a lot of fun; they had a ton of energy. It was very rewarding to see them get excited about my research,” said Jessica. Sarah adjusted her approach in presenting her research to the young researchers at SCSW. She provided basic information using figures and illustrations to convey ideas to high school students. “I could not assume that my audience knew anything about my research beforehand,” says Sarah. She noted the students would not have the education and experience of her peers. She reduced the amount of data in her poster and made an effort to explore and explain the figures with the students. Doing this helped Sarah become much more aware of the delicate balance between data and illustrations in her poster. Jessica found that creating a poster that used simplified language for a general audience was the best approach. Her audience would not understand the technical jargon of her field. She ensured that her fonts, text and graphs were simple to understand. She discovered that illustrating how her research would benefit society in a positive, long-term manner helped the audience understand the purpose and benefit of her work. Sarah recognized the importance of speaking to the students on their level and getting her message and research across in an easy-to-understand manner. “In terms of shaping the scientific message for a general audience, you want to make sure you explain why your research is important to the general public,” advises Sarah. Sarah quickly ascertained that it helps to avoid scientific jargon as well. She focused on the high-level points so an average, intelligent and inquisitive young adult could understand the important message. This is critical when the public is funding research and may not easily understand the significance or benefits of the work performed. In seeking help to develop the posters, Jessica turned to her supervisor and mentor for guidance. She asked her family to review the poster since they were not familiar with the technical jargon of her field. They proved to be a good general audience that could provide positive feedback. Sarah attended a Communications, Education and Public Affairs (CEPA) poster preparation workshop that covered many of the key aspects of creating a poster. The CEPA workshop discussed layout, text to image ratios and overall presentation. She also received valuable feedback from her peers at the workshop on her poster. Jessica has learned that developing a poster does not need to be a difficult task and is an important skill to have in one’s toolkit. Creating a poster should take into consideration the audience, presenting the information in an easy-to-understand format and making the poster visually appealing all help to engage the audience. “No matter how important the scientific findings are, if the poster is not designed well no one will be able to understand the message,” said Jessica. Sarah found that the Argonne community has many resources to help researchers develop posters to tell their research story. CEPA has technical writers and graphic designers that are at the laboratory to assist researchers in poster, PowerPoint and conference presentations. “The Argonne community can help each other to improve our presentation skills for a specific audience,” says Sarah. Jessica Linville (ES) earned her bachelors of science in Chemical Engineering from the University of South Florida in 2008 and her Ph.D. in Environmental Engineering from the University of Tennessee in 2013. Her research focuses on turning waste into energy, specially producing bio-methane from sewage sludge. She aspires to fully develop her “waste-to-energy” research into a full-scale operation. Sarah Soltau (CSE) earned her Ph.D. in Chemistry at Boston University in August 2013. 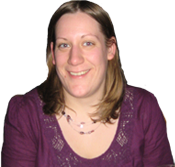 She works in CSE with Lisa Utschig to develop nature driven approaches to solar fuels. She seeks a position as a faculty member at a primarily undergraduate institution which will give her the opportunity to teach and do research with undergraduates. This entry was posted in Communicating Science and tagged Jessica Linville, poster session, researchers, Sarah Soltau, science careers in search of women, SCSW. Bookmark the permalink.